My dear husband and I had to run errands today. These errands required us to travel to a town about 30 mins from our house. Not a big deal. We had a great time. We were enjoying our errands and driving around so much that we ended up in the town next to the town we had to visit. Luckily, my LNS is located in said town. I asked my dear, dear husband if we could stop and he obliged. Oh, what a wonderful time I had! I was like a kid in a candy store...I could not get enough. Why was I so enthralled?? Well, lets suffice it to say that it has been over a year and a half since I was last IN my LNS!! Even better, Christmas is around the corner and my wonderful, loving husband started a Santa List for me!!! I am just as giddy as a little school girl! 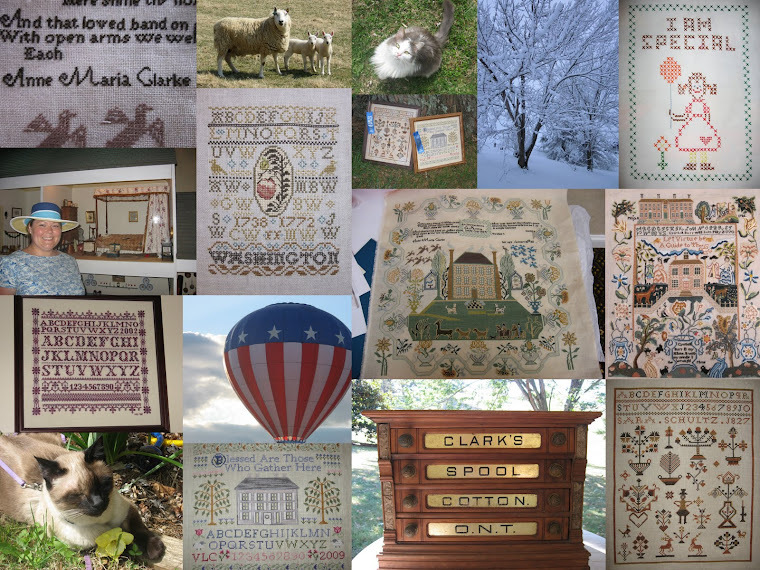 As I was looking through the hundreds of sampler patterns like a mad woman, I remembered a pattern that I heard about but have not been able to find. As a matter of fact, it was on another blog (which has left my head.) It was called the "Shenandoah Valley Sampler" and it dates back to the EARLY 80's. I figured, since my LNS is in the heart of the Shenandoah Valley, I would ask if she had heard of it. Lo and behold, not only had she heard of it but she had stitched it and had a pattern available for me!!! My eyes started to tear up (no kidding!) I have looked for that pattern for almost a year and finally found it! I am still in shock! I cannot believe my good fortune! I cannot wait to kit it up and hopefully get started on it the first of the year.